← Of Bagels and the iPhone! 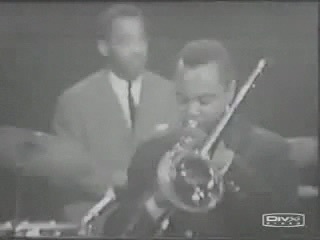 This YouTube post by Zemry features a host of be-bop greats: J.J. Johnson, Sonny Stitt, Howard McGhee, Walter Bishop, Tommy Potter, and Kenny Clarke. It’s apparently a video transfer of a kinescope made for British TV in 1964. When I first saw and heard the YouTube clip, I thought the performance sounded familiar. Sure enough, I found that a CD I own contains the sound portion of the performance. Just to see if I could improve the sound of the video, I removed the original sound track in iMovie and applied the CD’s sound instead. The result does make the sound clearer, and the project is posted here in Quicktime form. Fortunately, J.J. “stomped” the tune off loudly enough on stage to make a fairly good audio sync possible, although it isn’t perfect. Note that the video clip doesn’t include the entire performance. For that reason, you’ll hear the music continue after the clip ends.